Having passed my 73rd, I’m blessed to be able to go out sporting heels and skirts without the use of a cane. lol Wearing a top and skort can be exhilarating here in the southwest when it is 100*+ but rest assured, I am very careful of how I wear those garments, what they look like on me and most of all how I will be observed. I do most of my galavanting during the day time as there’s a certain security in going out in broad daylight. Regardless though, some people will always notice us and think to themselves, or out loud, saying ah, he’s an old man, probably fell off his rocker or he’s senial and has lost his way. My personal favorite is “he’s deranged”. But there’s nothing we can do about what others think so critics be damned, have a good time. 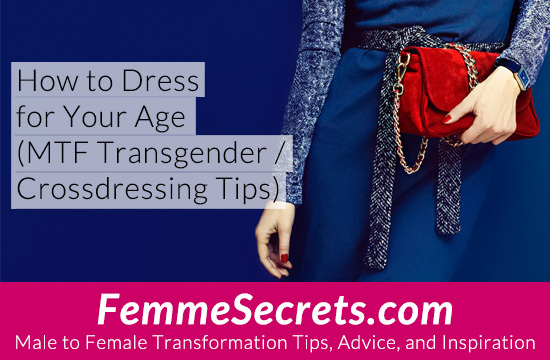 Age appropriate, ladies, is a must. Lest we give the public fodder and hinder our sisters. When you are at home? The world is your oyster. I’m 77, going on 101. Actually, 101 is the age I will be, when I decide when I’m going to meet the Lord. However, I like to dress young, when I stay at home, because I feel young doing so. When I go out, I wear clothes, that your 50 and 60 year old ladies, you’ve shown. With them, I feel pretty. I’m a 32 Gender fluid. Some people call me a cross dresser, but when I am expression my feminine side I try to dress according to my age. I get many good compliments, and a pass so well that I have no trouble from anyone when “she” uses the women’s restroom. Everyone that see me addresses me as Ma-am or She. I even had guys get the door for me, as a gentleman would for a Lady. I feel like all this would not be possible if i wasn’t Fashion conscientious and dress for my age. However, a part of me really wants to wear the clothes Of a Teenage girl, given that i never got to actually to do that. So I have decided to fore fill this desire by dressing as a teenager in private, or for Halloween, and being age appropriate with my dress in public. This seems to be working for me. If you are wondering YES, I spend a lot of money on my Halloween Costume. 😛 It drives my girlfriend Crazy.